By now you should have a log line, query letter, and a database of industry contacts. In this article we’re going to tie everything together and start making some query letter submissions. In this day and age there are basically three ways of making a cold submission; regular “snail” mail, email and faxes. I used to do a ton with regular mail, sending out thousands of query letters this way. I’m finding now that the cost and time simply don’t justify it since I can send out emails and faxes so quickly and cheaply. However, if you’re not going to do large blasts like I do and take advantage of the tools that allow you to send large volumes of queries, you might seriously consider mailing your query letter. Most people are not sending hard letters anymore, so I actually think this method will become more effective in the coming years as less and less people use it, making your letter stand out more. Since you have all the contact information in an Excel spreadsheet you can use MS Word’s Mail Merge function to create a nice looking letter with a proper heading and address for each company on it, making your letter look a lot less like a form letter. I recommend that you hand write the addresses on all the envelopes when you send them out. I’ve seen a nice jump in the response rate with handwritten names and addresses on the envelopes. I think this is because printed labels, while easy, look more like junk mail and may get discarded before even being read. If the envelope is handwritten someone in the office at least has to open it to see what it is. I’ve found that faxing a query letter to a company is a very effective way to send cold query letters (which is why I include faxes in my own email / fax blast service). Most other writers don’t send faxes, which is why I think it works so well. If you use any number of fax services to send your letter, it can be very cheap and actually easier than sending out email. I use a service called FlatRateFax.com but there are many others out there that do the same thing. You can upload your query letter in MS Word doc format and your Excel spreadsheet of addresses to FlatRateFax.com and they will merge the documents and send out the faxes to all the fax numbers in your spreadsheet. It takes a little bit of time setting up the files properly, but once you’ve done it you can blast out query letters in next to no time and for a pretty reasonable price, too. Overall, though, email is the easiest and cheapest way to send out query letters. You want to be careful sending out large volumes of mail using a free Hotmail, Gmail, or Yahoo account as they will turn your account off if they think you’re sending out spam. So stagger your submissions and don’t try and send out too many on any given day. Check out my post: Submitting Your Screenplay Via Email – How To Create A Catchy Subject Line. You’re going to get turned down a lot, in fact the vast majority of the time. Do not let rejection slow you down. Not even a little. I don’t. Any success I’ve had optioning and selling scripts is a direct result of me plowing forward even in the face of mountains of rejection letters. If you can get a positive response rate anywhere near 2% from any of these methods I would say you’re doing pretty well. Think about that for a moment. For every 100 letters you send out, you’re doing well if you get two script requests. Agents and especially managers seem the most open to reading material from new writers, so you should see a slightly higher response rate from them (maybe as high as 5%). But you’ll rarely see much more than about 2% from producers. I would recommend starting out with 200 queries to gauge the effectiveness of your letter. Once you start to get a few script requests you can step it up and start to do mass blasts. By only doing 200 letters at a time you won’t be alienating lots of producers with half baked letters and ideas. If you can’t get a few script requests out of a couple hundred letters you’re not ready for a massive campaign. 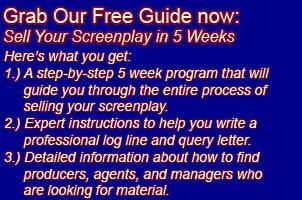 You’ll need to take a long hard look at your query letter and log line and rewrite them. Try again with another 200 letters and measure results again. Rewrite and try again. And just keep trying until you’re getting some producers to read your scripts. High concept log lines get a much better response rate than smaller indie type films. While this seems obvious, I would say this is one of the biggest problems I see with new writers. New writers often don’t consider the market place at all when they write their first few scripts (I know I didn’t). While “passion projects” are often fun to write, they’re usually impossible to sell. Positive response to your query letter will dwindle a lot if your idea isn’t high concept and marketable. So keep that in mind when you’re sending letters out and when you’re conceiving of new projects to write. I have over 600 agents and managers and over 1000 producers in my database so with some work hopefully you can build a database that large, too, to really give your screenplay a wide reach. The last screenplay that I optioned through cold query letter blasts took four blasts. I did one initial blast to my list of agents and managers, and while I did get a few offers for representation, I didn’t get any that I felt would really help me. So then I blasted it three times to my producer list. It was the exact same query letter all four times and the response rate did dwindle each time. But eventually I did option the screenplay. So you need to build your database up to a significant number of contacts, and you need to hit each contact multiple times with each pitch. Obviously you’ll want to respect people’s time and if they ask to be removed from your list you should remove them. In my experience this rarely happens as long as you’re submitting a professional looking query letter. As I’ve mentioned before, I offer an email and fax blast service where you simply provide a query letter and I blast it for you to my list. If you want to save yourself some time building and then sending to your own list you might consider my service. To learn more about my service go here: Query letter submission service. Bonus Tip: Hopefully you collected phone numbers in your database! Cold calling production companies can work quite well. I once hired a phone salesperson to cold call production companies and pitch one of my screenplays. She was able to get five script requests out of only ten total phone calls. I’ve had friends who have tried this method, too, and it’s quite effective. I suspect one of the reasons it’s so effective is because most screenwriters (like me) won’t do it. If you’re good at selling over the phone, you should seriously consider trying this. Finding phone numbers for companies is usually easier than finding a fax number or an email address so your pool of companies to pitch to should be quite large. Another great source of young producers looking for material is online sites devoted to screenwriters like Stage 32 and even places like Craig’s List. Read my post about submitting your screenplay to online ads like this: Submitting your screenplay to Craig’s List postings. Since you’ve already spent the time crafting a log line and query letter, it’s quite easy to make these sorts of submissions so it’s definitely worth doing. I sold my first screenplay, Dish Dogs, many years ago by submitting to a company who had an open call for script submissions in one of the trade magazines. So you never know where these leads might go. Warning: The ideas I’ve proposed above should not be used if they violate any local or state laws which they very well might since these emails and faxes may be considered SPAM. Most areas have laws forbidding SPAM and by sending unsolicited material to a company you may very well be spamming them. I’ve never had any problems; however, you should consult with a lawyer if you have any questions about the laws in your area.